Review – Beacon by Michelle Irwin – Heartbreaking 5 Stars!!! Despite everything, the love that Beau and Phoebe share has tied their paths together forever. When they felt nothing could tear them apart, life threw them a bombshell that the whole family struggles to overcome. With a blessing, can often come a curse. Can Beau fight enough to survive? I won’t beat about the bush with Beacon, this book will tear you apart, inside and out! This story completely broke me. To the point that I had to stop reading it and take a break. I couldn’t read for the tears streaming down my face and for the realisation that the characters I had come to love were having their lives ripped apart, once again. I screamed at my kindle, I shouted at the room, and I wanted to throw my kindle out the window; only I love it too much to do any harm to it! Michelle Irwin has written a master piece with Phoebe Reede the untold story. 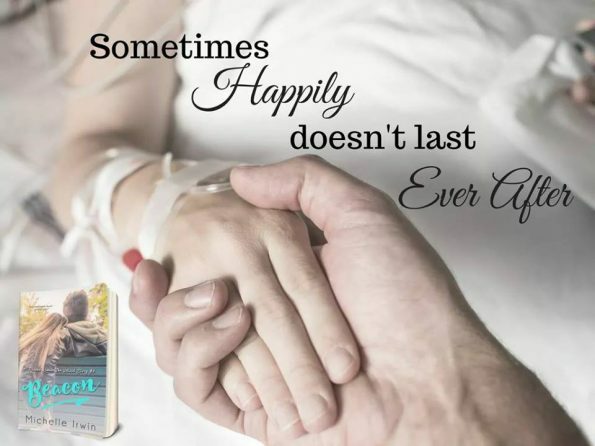 This series starts out as a beautiful contemporary romance and ends with the reality that life can be so cruel, whilst at the same time showing us that behind every cloud there is a silver lining, it’s just one we don’t always realise is there. I can’t go into detail without giving away the whole plotline. Although the ending to this series will not be to everyone’s satisfaction, I feel Michelle has given the characters a happy ending, all be it an emotional one. It might not seem it, but if you sit back and think over all six books of the series, you will realise that dreams were achieved, and happiness was found. Michelle Irwin for me, gave her characters a story that is both realistic, and relatable. Beacon will require a lot of tissues and a lot of hugs. The Phoebe Reede series for me is a master piece; a series I can read time, and time again, and it will still provoke the same emotions out of me. You won’t regret one-clicking this series!